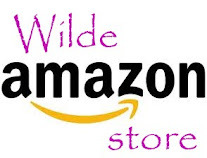 Among all of the big changes that have been happening in the Wilde household, the change in living situations is probably one of the biggest. For the past eight years, boyfriend and I have been a long distance couple. It did help that we've known each other for the past fifteen years and also that we were both so very busy while we were apart. Boyfriend was busy building his career and getting a great job, while I spent my time holed up in labs finishing my education. Now that we are living in one household it's totally different. Good different! Not only are the living expenses cut in half (a great bonus), but sometimes I arrive home to discover the laundry I put in the dryer that morning has folded itself up and put itself away! The dishwasher empties itself and even dinner arrives without me having to lift a finger! Now, I realize that boyfriend might have a bit to do with the amazing feats of housework and food prep (ordering) because these things never happened when I was living alone! Food covered dishes would just sit in the sink until I faced the music and put them in the dishwasher. Laundry would remain in the dryer until I tried to run another load, so that's where those pants were all week... Dinner would often be a bowl of lettuce that I would call a salad. Living with boyfriend definitely has is benefits, most of all being, I get to see him every day. Another benefit to living with boyfriend is that I get to pass my food concoctions off onto someone else! Plus, I have someone to take the dough out of the fridge before I get home! So far there have been no complaints about the things that I've been feeding him, I think I'm the tougher critic. This pizza was delicious, the pancakes I burnt on Sunday, less so. In a small pot, warm olive oil to 100 F. Add basil, salt, pepper and garlic. 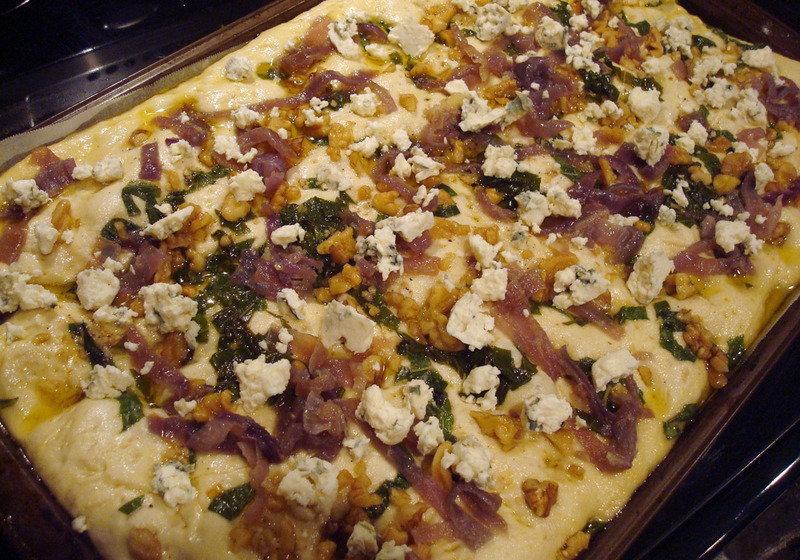 Prepare the foccacia dough, with prepared herb oil, and allow to retard in the fridge overnight. Place chopped walnuts in a small pan and heat over medium-low heat. Shake or stir occasionally. Do not walk away for too long, the nuts will burn fast. They are done when the smell delicious and nutty. Cut onions into slices. Heat a medium pan to medium heat and melt 4 tbsp butter. Add onions and cover with a lid. Cook for 5-7 minutes, until the onions are soft. Remove lid and drop temperature to medium-low. Cook onions until sweet and caramelized. Reserve in a bowl for day 2. 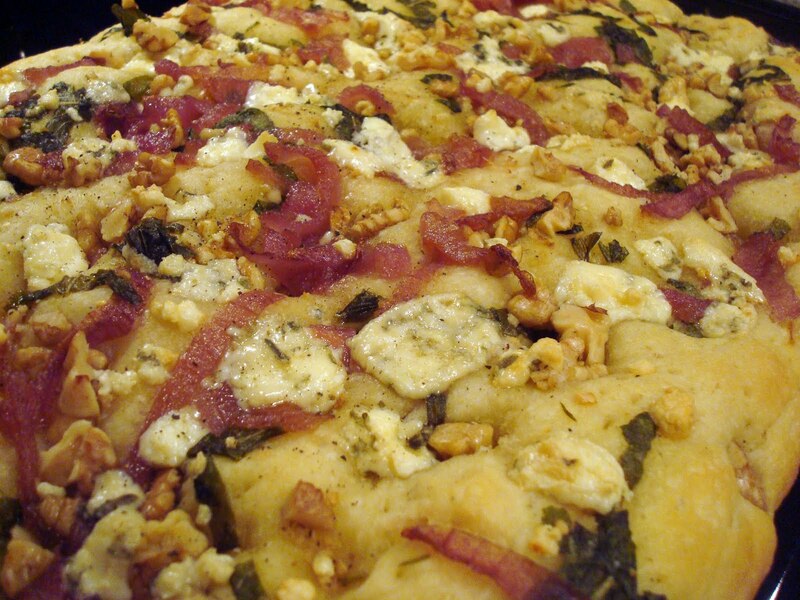 Remove foccacia from the fridge and sprinkle on walnuts and caramelized onions. Allow the dough to rise for 2-3 hours, until about 1-inch thick. Heat oven to 500 F. Add crumbled blue cheese. Place pizza in the oven and lower temperature to 450 F. Bake for 10 minutes and rotate 180 degrees. Bake for another 5-10 minutes or until the foccacia is golden brown (should register an internal temperature of 200 F). Remove from the oven and slide off of the baking sheet onto a wire rack. Allow to cool for 10 minutes before slicing and enjoying!